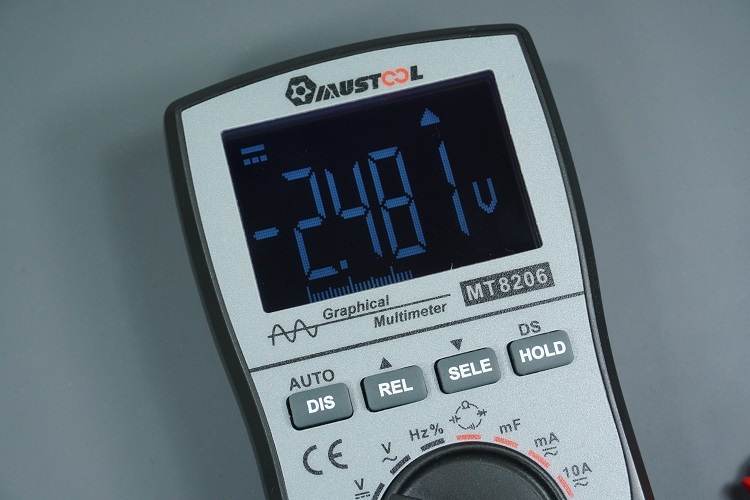 In this article we’re going to review the MUSTOOL MT8206 Multimeter. 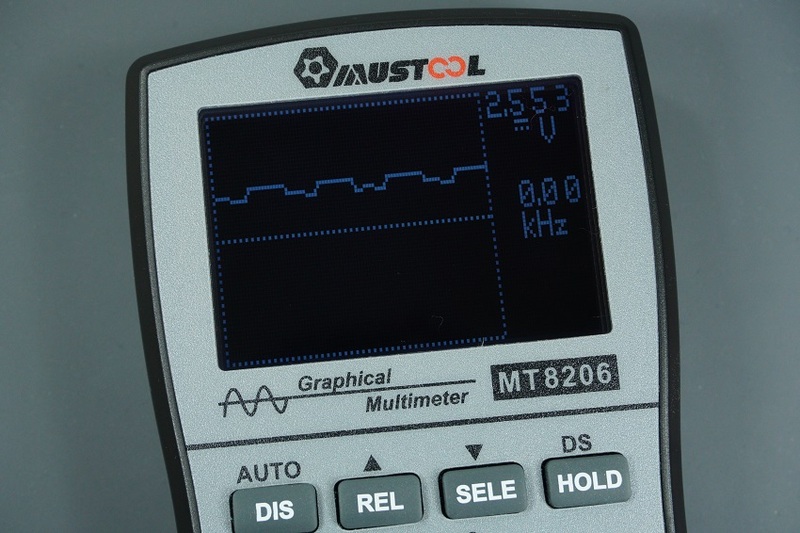 The MT8206 combines an auto-range multimeter with a graphical waveform display so that you can see how voltage and current measurements change over time (like in an oscilloscope). 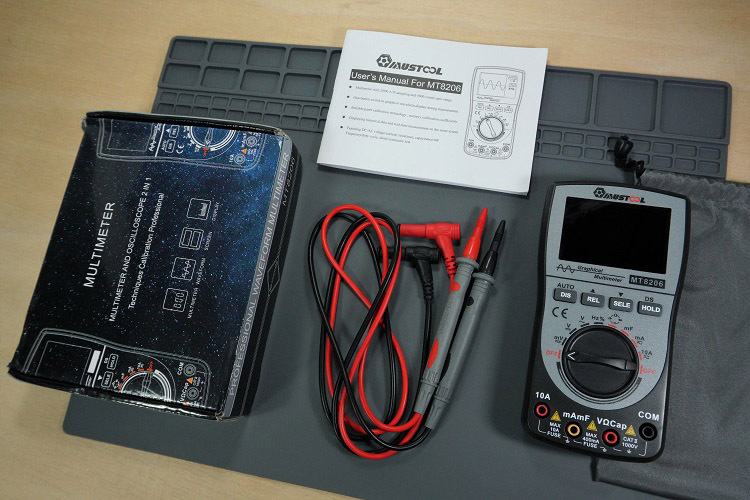 Although the product page says it is a “multimeter and oscilloscope 2 in 1”, it can’t be called an oscilloscope. It doesn’t have labeled scales and other basic functionalities you would expect in an oscilloscope. I would rather call it a “waveform display”. 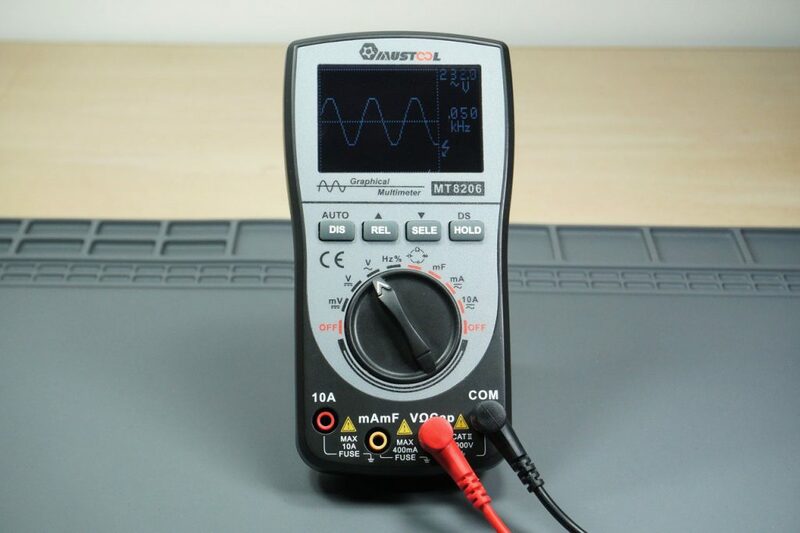 The MT8206 Multimeter Oscilloscope (2 in 1) was kindly sent to review from Banggood. 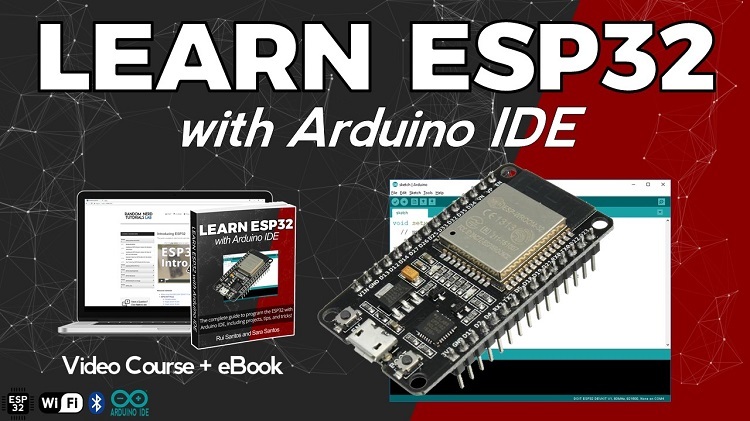 You can learn more about this device by visiting the product page below. 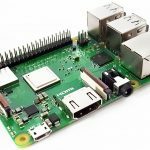 Although the MT8206 has a 5-star rating on its product page, for around $60 I was very disappointed with this product – continue reading to see why. 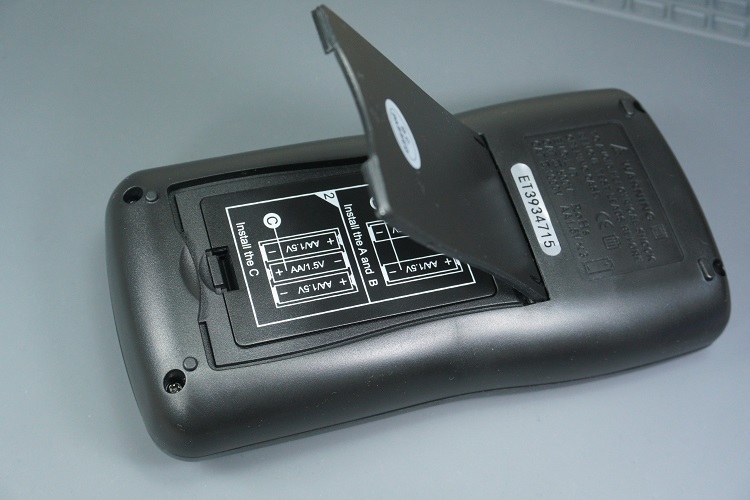 The MT8206 came in a cardboard box as shown in the figure below. Inside the package there is the multimeter, a pouch, a pair of probes, and an instructions manual. The instructions manual comes in English and explains in great detail how to use the device. The probes seems to be really good in a high-quality plastic and the ends are protected with caps. 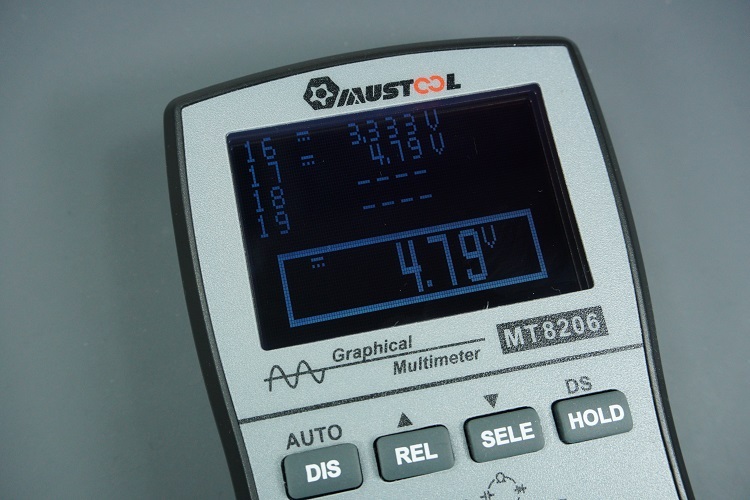 The multimeter itself seems made out of cheap plastic and the tilt stand at the back is too thin for the multimeter’s size. The multimeter requires 3 AA batteries to operate and they are not included. The batteries are placed under the tilt stand. The MT8206 has 200k A/D sampling and 4000 counts autorange. 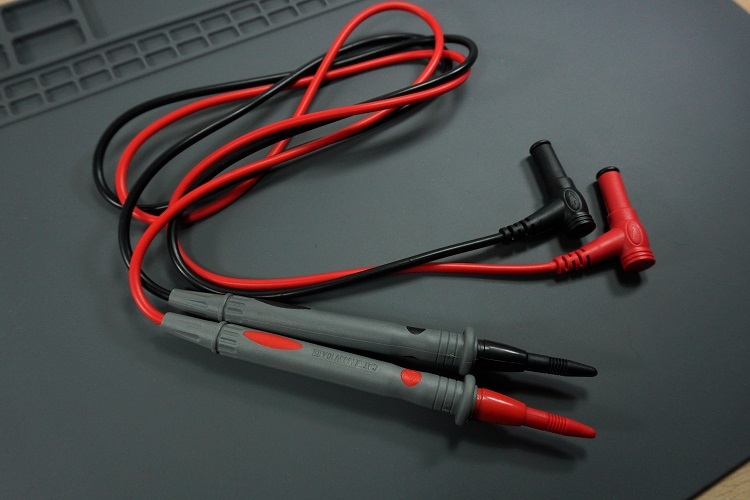 It measures DC/AC current and voltage, resistance, capacitance, frequency, duty cycle, diode and continuity test. During measurements, besides the actual reading, it also displays a 41-segment analog bar, which I didn’t find very useful. 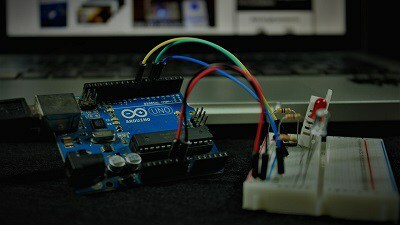 Relative value measurement (REL) mode that displays the difference between the current measurement and the reference value (the manual explains how to use it). Holding and saving data: it allows you to save 100 sets of data and 10 waveforms. Show saved and current data at the same time: this is useful to compare measurements. Waveform display: displays a representation of the voltage and current over time. 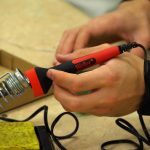 The instructions manual is very good and explains in detail how to use all the multimeter’s functionalities. 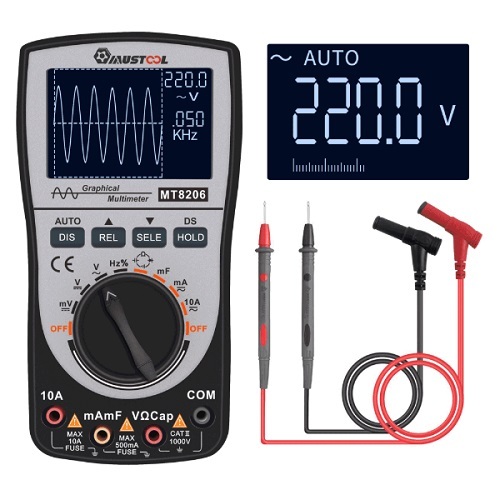 Our first impression about this tool was good, because on the product page you can read “2 in 1 Intelligent Digital Oscilloscope Multimeter”. So, you would expect a multimeter with a built-in basic oscilloscope. But that’s not exactly the case. I was very disappointed when I started experimenting because the MT8206 lacks most basic functionalities of an oscilloscope. It doesn’t have scales on the axis. 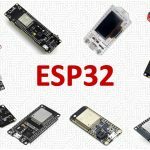 Even though you can adjust the base time, there isn’t any indication of time scale selected, making it impossible to take any time measurements. There isn’t any label on the vertical axis either, but there’s an indication of the voltage value and frequency. Additionally, only repeatable waveforms can be measured for DC voltage. 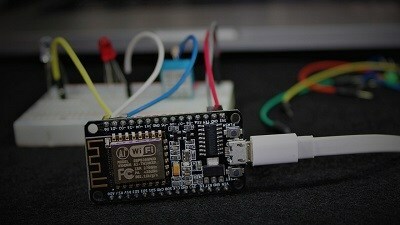 Moreover, the display has low resolution and the refresh is very slow, which makes the waveform distorted. The following waveform is a PWM signal. It definitely doesn’t look good. 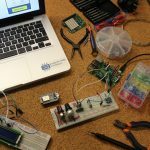 If you need a real oscilloscope then this probably won’t work for you. However, you’ll never find a real scope for this price. But, in my opinion, there are better toy oscilloscopes than this one. For example, the JYETech DSO150 Digital Oscilloscope works way better than this. 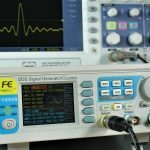 Read our review: JYETech DSO150 Digital Oscilloscope Review. 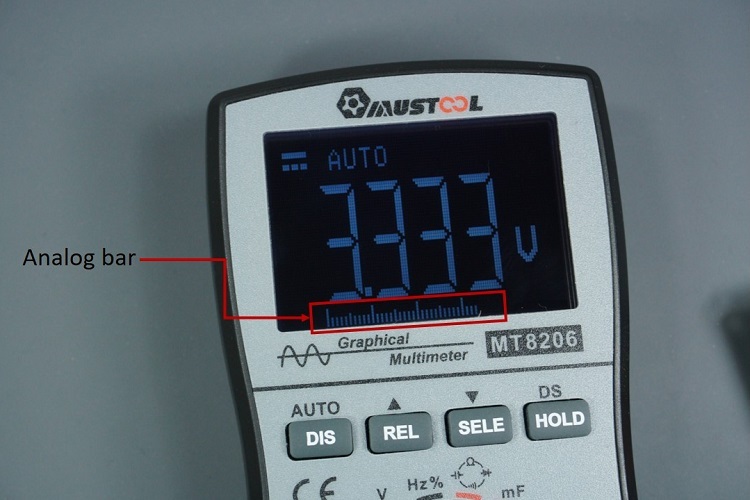 The digital multimeter functions are very useful but you can get a better multimeter for this price. Additionally, there are some things that I didn’t like. For example, it beeps too loud and it is impossible to turn it off. 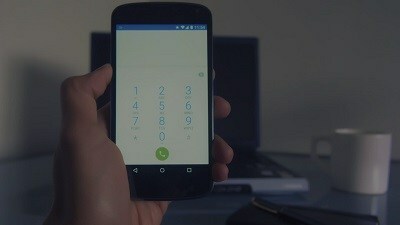 However, I’ve read that Mustool released an improved version that has silent mode – so that should be already fixed. The multimeter takes too long to respond to button presses and the buttons get stuck very easily. 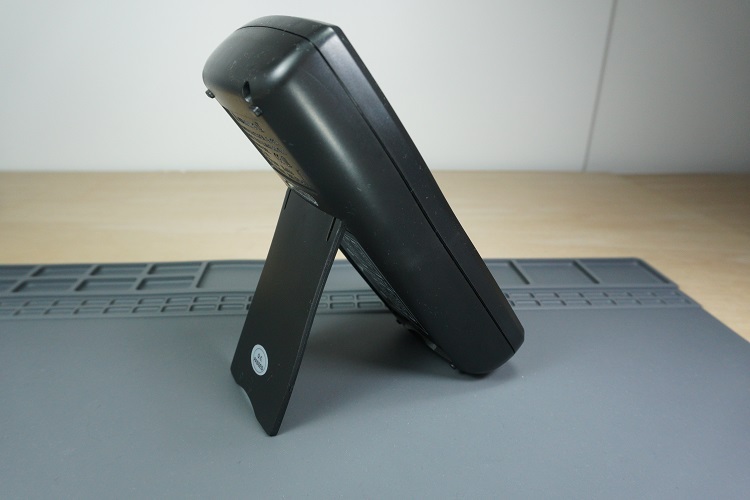 Additionally, it is made out of cheap plastic and the tilt stand is very thin. The other Multimeter features work as expected. Overall, I am very disappointed with this product. I’m not saying that this is not good for some applications, but I was expecting something better for the price. 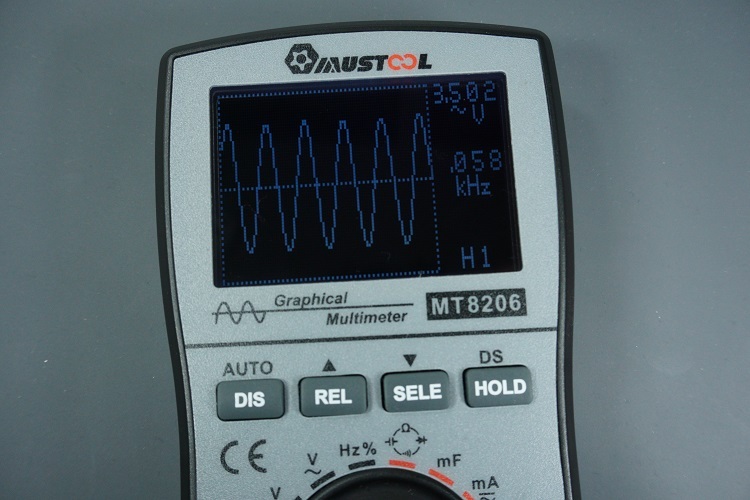 The MUSTOOL MT8206 might be good for small repairs and troubleshooting and the signal representation may be useful, regardless of its accuracy. However, because the display updates so slowly, I’m not sure if the waveform display function will be useful. 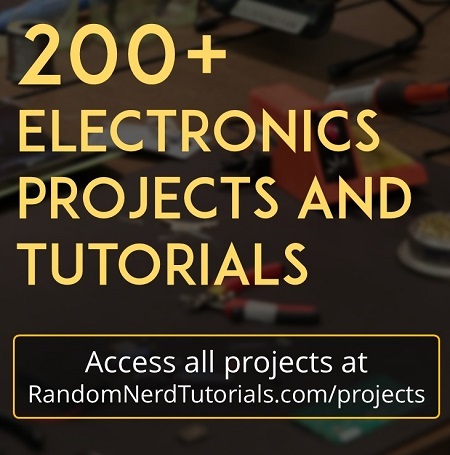 ANENG AN8002 Multimeter Review – Best Low Cost Multimeter? I hope you liked reading our review about the MUSTOOL MT8206. The revised version ($40US) does make it easy to turn off the very annoying sounds but the “oscilloscope” is still pretty worthless. The meter display has large easy to read characters and sometimes the memory is handy but overall it is not too impressive. Yes, in the product page, they say the new version has a silent mode. The multimeter functions work well, but as you say the “osciloscope” part is not very useful.